Thermotoga thermarum Windberger et al. 1989 is a member to the genomically well characterized genus Thermotoga in the phylum ‘Thermotogae’. T. thermarum is of interest for its origin from a continental solfataric spring vs. predominantly marine oil reservoirs of other members of the genus. The genome of strain LA3T also provides fresh data for the phylogenomic positioning of the (hyper-)thermophilic bacteria. T. thermarum strain LA3T is the fourth sequenced genome of a type strain from the genus Thermotoga, and the sixth in the family Thermotogaceae to be formally described in a publication. Phylogenetic analyses do not reveal significant discrepancies between the current classification of the group, 16S rRNA gene data and whole-genome sequences. Nevertheless, T. thermarum significantly differs from other Thermotoga species regarding its iron-sulfur cluster synthesis, as it contains only a minimal set of the necessary proteins. Here we describe the features of this organism, together with the complete genome sequence and annotation. The 2,039,943 bp long chromosome with its 2,015 protein-coding and 51 RNA genes is a part of the Genomic Encyclopedia of Bacteria and Archaea project. Strain LA3T (= DSM 5069 = NBRC 107925) is the type strain of the species Thermotoga thermarum , one out of currently nine species in the genus Thermotoga . The genus name was derived from the Greek word thermê, heat, and the Latin word toga, Roman outer garment; Thermotoga, the hot outer garment ; the species epithet was derived from the Latin word thermarum, of warm springs, of warm baths . Strain LA3T was originally isolated from a hot continental solfataric spring in Lac Abbé, southwest of Asbalto, Djibouti . Here we present a summary classification and a set of features for T. thermarum LA3T, together with the description of the genomic sequencing and annotation. The single genomic 16S rRNA gene sequence of T. thermarum LA3T was compared with the Greengenes database  for determining the weighted relative frequencies of taxa and (truncated ) keywords as previously described [6,7]. The most frequently occurring genera were Thermotoga (53.9%), Thermosipho (29.1%), Fervidobacterium (11.0%), Caldicellulosiruptor (2.5%) and ‘Thermopallium’ (1.4%) (130 hits in total). Regarding the two hits to sequences from members of the species, the average identity within HSPs was 100.0%, whereas the average coverage by HSPs was 95.7%. Regarding the 37 hits to sequences from other members of the genus, the average identity within HSPs was 92.1%, whereas the average coverage by HSPs was 98.4%. Among all other species, the one yielding the highest score was Thermotoga hypogea (U89768), which corresponded to an identity of 94.2% and an HSP coverage of 99.1%. (Note that the Greengenes database uses the INSDC (= EMBL/NCBI/DDBJ) annotation, which is not an authoritative source for nomenclature or classification.) The highest-scoring environmental sequence was DQ675048 (‘microbial production water-temperature petroleum reservoir clone QHO-B59’), which showed an identity of 99.0% and an HSP coverage of 82.0%. The most frequently occurring keywords within the labels of all environmental samples which yielded hits were ‘microbi’ (5.6%), ‘temperatur’ (3.2%), ‘spring’ (3.0%), ‘hot’ (2.6%) and ‘thermophil’ (2.3%) (117 hits in total). The most frequently occurring keywords within the labels of those environmental samples which yielded hits of a higher score than the highest scoring species were ‘microbi, petroleum, reservoir, temperatur’ (11.8%), ‘product, water’ (6.0%) and ‘aggregate-form, biodegrad, crude-oil-adh, fluid, niiboli, oilfield, produc’ (5.8%) (2 hits in total). Some of these keywords fit well to the known ecology of T. thermarum. Figure 1. Phylogenetic tree highlighting the position of T. thermarum relative to the type strains of the other species within the family Thermotogaceae. The tree was inferred from 1,373 aligned characters [8,9] of the 16S rRNA gene sequence under the maximum likelihood (ML) criterion  and rooted  as previously described . The branches are scaled in terms of the expected number of substitutions per site. Numbers adjacent to the branches are support values from 250 ML bootstrap replicates  (left) and from 1,000 maximum-parsimony bootstrap replicates  (right) if larger than 60%. Lineages with type strain genome sequencing projects registered in GOLD  are labeled with one asterisk, those also listed as ‘Complete and Published’ with two asterisks [15–17] (for T. neapolitana and T. naphthophiliae see CP000916 and CP001839, respectively, and for Petrotoga mobilis CP000879). shows the phylogenetic neighborhood of T. thermarum in a 16S rRNA gene based tree. The sequence of the single 16S rRNA gene copy in the genome does not differ from the previously published 16S rRNA gene sequence (AB039769). The tree depicted in Figure 1 reveals discrepancies between the current classification of the group and 16S rRNA phylogenetic analysis. First, Thermotoga is nested within a paraphyletic Thermosipho, but without support under the maximum-parsimony criterion. Second, when drafting this study Thermococcoides shengliensis had not yet been assigned to Kosmotoga as K. shengliensis and thus was nested within paraphyletic Kosmotoga with almost maximal to maximal support (99–100%). To assess whether the disagreement between the 16S rRNA data and the classification regarding Thermosipho and Thermotoga was statistically significant, we conducted constraint-based paired-site tests as described earlier , using the assignment of the species to genera as depicted in Figure 1 (assigning T. shengliensis to Kosmotoga) as constraint. Search under the maximum-likelihood criterion yielded a best tree with a score of −9,500.82 if the search was unconstrained but a tree with a log likelihood of −9,521.15 under the constraint; this was not significantly worse in the SH test as implemented in RAxML (α = 0.05). Hence, the Thermosipho-Thermotoga problem seems to be negligible. In contrast, the only recently fixed Kosmotoga-Thermococcoides problem was much more apparent in the 16S rRNA gene data. It is also of distinct origin, as it seems to be caused by confusing treatments of issues of nomenclature. In 2009, DiPippo and coworkers  described Kosmotoga olearia as novel species in a novel genus. In the following year, Feng and colleagues , without comparing their newly isolated strain to the type strain of K. olearia (which might not yet have been publicly available when the study presented in  was conducted), published T. shengliensis, also in a novel genus. More recently, Nunoura et al. added K. arenicorallina to the genus Kosmotoga. These authors also realized that T. shengliensis and K. olearia are more closely related to each other than K. arenicorallina to K. olearia and thus suggested to place T. shengliensis in Kosmotoga as K. shengliensis because Kosmotoga has priority over Thermococcoides. Whereas the validation of K. arenicorallina was accepted by the International Journal of Systematic and Evolutionary Microbiology (IJSEM) , K. shengliensis was at first not accepted by the editors of IJSEM with reference to rule 31a  of the Bacteriological Code (Nunoura, pers. comm.). Probably the editors opined that a DNA-DNA hybridization experiment  between the type strains of K. olearia and T. shengliensis should be conducted to assess whether both represent a single or two distinct species. In the meantime, the name K. shengliensis has been validated, however. The advantages of this solution can be demonstrated by considering the number of conflicts between data and classification. With Thermococcoides shengliensis in use, the classification of the group caused one obvious problem, the paraphyly of Kosmotoga (Fig. 1), and one potential problem, that K. shengliensis and T. shengliensis might be conspecific. By accepting the proposal in  to assign T. shengliensis to the genus Kosmotoga, the first problem was solved and the second problem was not worsened. T. thermarum LA3T is Gram-negative-staining and rod-shaped, with a sheath that extends past the ends of the cell (Figure 2). Cells were reported to be 0.6 µm in width and 1.5–11 µm in length . Flagella and motility were observed  (Table 1). Growth occurred between 55°C and 84°C with an optimum at 70°C . The pH range for growth was 5.5–9.0 with 7.0 as the optimum . The salinity range for growth was 0.2% to 0.55% NaCl with 0.35% as the optimum value . Yeast extract was required for growth, and addition of glucose, maltose, or starch significantly increased cell yield . H2 and S0 both inhibited growth, and H2S was not formed from S0 . Classification and general features of T. thermarum LA3T according to the the MIGS recommendations . Evidence codes - TAS: Traceable Author Statement (i.e., a direct report exists in the literature); NAS: Non-traceable Author Statement (i.e., not directly observed for the living, isolated sample, but based on a generally accepted property for the species, or anecdotal evidence). Evidence codes are from of the Gene Ontology project . The analysis of complex lipids in strain LA3T showed that they were similar to those of T. maritima except that the less polar glycolipid was absent . Analysis of core lipids showed that strain LA3T had one unidentified core lipid that was not present in T. maritima . This organism was selected for sequencing on the basis of its phylogenetic position , and is part of the Genomic Encyclopedia of Bacteria and Archaea project [36,37]. The genome project is deposited in the Genomes On Line Database  and the complete genome sequence is deposited in GenBank. Sequencing, finishing and annotation were performed by the DOE Joint Genome Institute (JGI). A summary of the project information is shown in Table 2. T. thermarum strain LA3T, DSM 5069, was grown anaerobically in DSMZ medium 498 (Thermotoga II medium)  at 80°C. DNA was isolated from 0.5–1 g of cell paste using MasterPure Gram-positive DNA purification kit (Epicentre MGP04100) following the standard protocol as recommended by the manufacturer with modification st/DL for cell lysis as described in Wu et al. 2009 . DNA is available through the DNA Bank Network . The genome was sequenced using a combination of Illumina and 454 sequencing platforms. All general aspects of library construction and sequencing can be found at the JGI website . Pyrosequencing reads were assembled using the Newbler assembler (Roche). The initial Newbler assembly, consisting of one contig in one scaffold, was converted into a phrap  assembly by making fake reads from the consensus, to collect the read pairs in the 454 paired end library. Illumina GAii sequencing data (290.0 Mb) was assembled with Velvet  and the consensus sequences were shredded into 1.5 kb overlapped fake reads and assembled together with the 454 data. The 454 draft assembly was based on 14.0 Mb 454 draft data and all of the 454 paired end data. Newbler parameters are -consed -a 50 -l 350 -g -m -ml 20. The Phred/Phrap/Consed software package  was used for sequence assembly and quality assessment in the subsequent finishing process. After the shotgun stage, reads were assembled with parallel phrap (High Performance Software, LLC). Possible mis-assemblies were corrected with gapResolution , Dupfinisher , or sequencing cloned bridging PCR fragments with subcloning. Gaps between contigs were closed by editing in Consed, by PCR and by Bubble PCR primer walks (J.-F. Chang, unpublished). A total of 16 additional reactions were necessary to close gaps and to raise the quality of the finished sequence. Illumina reads were also used to correct potential base errors and increase consensus quality using a software Polisher developed at JGI . The error rate of the completed genome sequence is less than 1 in 100,000. Together, the combination of the Illumina and 454 sequencing platforms provided 149.0 × coverage of the genome. The final assembly contained 414,118 pyrosequence and 1,166,274 Illumina reads. Genes were identified using Prodigal  as part of the Oak Ridge National Laboratory genome annotation pipeline, followed by a round of manual curation using the JGI GenePRIMP pipeline . The predicted CDSs were translated and used to search the National Center for Biotechnology Information (NCBI) non-redundant database, UniProt, TIGRFam, Pfam, PRIAM, KEGG, COG, and InterPro databases. These data sources were combined to assert a product description for each predicted protein. Additional gene prediction analysis and functional annotation was performed within the Integrated Microbial Genomes - Expert Review (IMG-ER) platform . The genome consist of one circular chromosome of 2,039,943 bp length with a 40.3% G+C content (Table 3 and Figure 3). Of the 2,066 genes predicted, 2,015 were protein-coding genes, and 51 RNAs; 69 pseudogenes were also identified. The majority of the protein-coding genes (74.3%) were assigned a putative function while the remaining ones were annotated as hypothetical proteins. The distribution of genes into COGs functional categories is presented in Table 4. Graphical map of the chromosome. From outside to the center: Genes on forward strand (colored by COG categories), Genes on reverse strand (colored by COG categories), RNA genes (tRNAs green, rRNAs red, other RNAs black), GC content(black), GC skew (purple/olive). Because a number of complete genome sequences of type strains from the phylum has already been published, we conducted a phylogenomic analysis using the bioinformatics pipeline established in  and further modified as described in [18,49]. The resulting supermatrix comprised 1,889 genes and 582,906 characters before, 1,168 genes and 360,527 characters after cleaning with MARE. The selected model was PROTGAMMALGF; the resulting tree had a log likelihood of −3,783,776.37 and is shown in Figure 3. The best maximum-parsimony tree found had a length of 404,859 steps (not counting uninformative characters) and was topologically identical. The gene-content matrix comprised 3,267 characters and yielded best trees with a log likelihood of −13,904.74 and a parsimony score of 2,243, respectively. Bootstrapping support values from all four applied methods are shown in Figure 4 if larger then 60%.The phylogenomic trees disagree with the 16S rRNA tree (Fig. 1) in some respects. 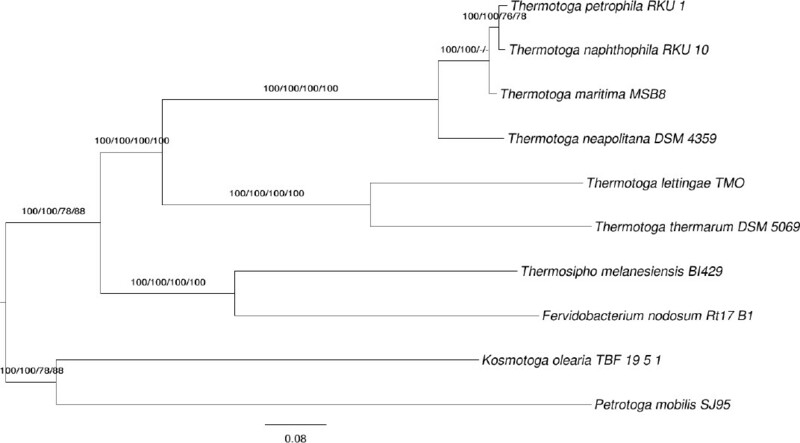 For instance, Thermosipho appears as a sister group of Fervidobacterium. Hence we assessed whether the 16S rRNA alignment described above, if reduced to the strains used in the phylogenomic analysis, is in significant conflict with the phylogenomic topology. Using the kind of constraint analysis mentioned above, search under the maximum-likelihood criterion yielded a best tree with a score of −5,425.82 if the search was unconstrained but a tree with a log likelihood of −5,436.37 under the constraint; this was not significantly worse in the SH test as implemented in RAxML (α = 0.05). Under maximum parsimony, the globally best trees had a score of 512, whereas the best constrained tree was 529 steps in length; this was significantly worse according to KH test implemented in PAUP* (p = 0.0148). Phylogenetic tree inferred from completely sequenced genomes of the ‘Thermotogae’ type strains. The tree was inferred from 360,527 aligned amino acid characters under the maximum likelihood (ML) criterion and rooted using midpoint rooting . The branches are scaled in terms of the expected number of substitutions per site. Numbers above the branches are bootstrapping support values (if larger than 60%) from (i) maximum-likelihood supermatrix analysis; (ii) maximum-parsimony supermatrix analysis; (iii) maximum-likelihood gene-content analysis; (iv) maximum-parsimony gene-content analysis. Currently there is neither evidence for a significant discrepancy between 16S rRNA and whole-genome data, nor a significant disagreement between 16S rRNA and the classification after Thermococcoides shengliensis was placed in Kosmotoga as K. shengliensis (see above). Nevertheless, as usual  the phylogenomic trees are much better resolved than the 16S rRNA phylogenies, and the Kosmotoga-Thermococcoides question could also be addressed in greater detail if the genomes of the type strains were available, as digital replacements of DNA-DNA hybridization have been implemented . The classification of the group thus can only benefit from additional genome-sequenced type strains. The T. thermarum genome has numerous differences from the other Thermotoga genomes, particularly with regard to cofactor metabolism. Some of these differences are shared with T. lettingae, which is more closely related to T. thermarum than the other Thermotoga species with sequenced genomes (Figs. 1 and 4). There appears to be a significant difference in Fe-S cluster synthesis between T. thermarum and the other Thermotoga species. Fe-S cluster synthesis requires at the minimum a cysteine desulfurase to produce sulfur and a scaffold protein for Fe-S cluster assembly (reviewed in ). There are three Fe-S cluster biosynthesis pathways in bacteria: Nif, Isc, and Suf . T. maritima uses the Suf system. It has an operon with sufCBDSU genes and another operon with a second copy of sufCB . The SufS protein is a cysteine desulfurase. In Bacillus subtilis, which has a similar set of Suf proteins as T. maritima, the SufU protein has been shown to be a scaffold protein . In Escherichia coli, which lacks the SufU protein, SufB is a scaffold protein, and SufC and SufD are required for iron acquisition . In E. coli the Suf genes are expressed under iron starvation conditions . T. maritima, therefore, may have two scaffold proteins, SufU and SufB. T. thermarum has a cluster of four genes (Theth_0902-0905) including two cysteine desulfurases and two proteins similar to SufU, but the SufBCD proteins are not present in the T. thermarum genome. Thus T. thermarum appears to encode a minimal set of Fe-S cluster synthesis proteins. It is possible that in Thermotogales and Firmicutes SufU is used as the scaffold protein if iron is plentiful, while SufBCD is required under low-iron conditions. T. thermarum may have access to more iron in its environment than other Thermotoga species. Interestingly, adjacent to the Fe-S cluster biosynthesis genes in T. thermarum is a transporter for which the closest characterized homolog is ZupT from E. coli, which transports iron and other divalent metals . T. lettingae has similar Fe-S cluster synthesis genes as T. thermarum but also encodes the sufCB genes. All of the Thermotoga species lack uroporphyrinogen synthesis and most of vitamin B12 synthesis, and the only enzyme of B12 metabolism common to all Thermotoga genomes is the adenosyltransferase that produces adenosylcobalamin from cobalamin. However, T. thermarum contains several genes clustered together (Theth_1729-1737) involved in the later steps of cobalamin synthesis, suggesting that it can utilize precursors of cobalamin that the other Thermotoga species can not utilize. Most of these genes are also found in T. lettingae. T. thermarum and T. lettingae are the only Thermotoga species to have genes for tungsten-dependent aldehyde:ferredoxin oxidoreductases (Theth_0853, Theth_1019). Theth_0853 has 68% amino acid identity to the formaldehyde:ferredoxin oxidoreductase of Pyrococcus furiosus, suggesting it was recently acquired. These enzymes use a bis-molybdopterin form of molybdenum cofactor with tungsten in place of molybdenum . 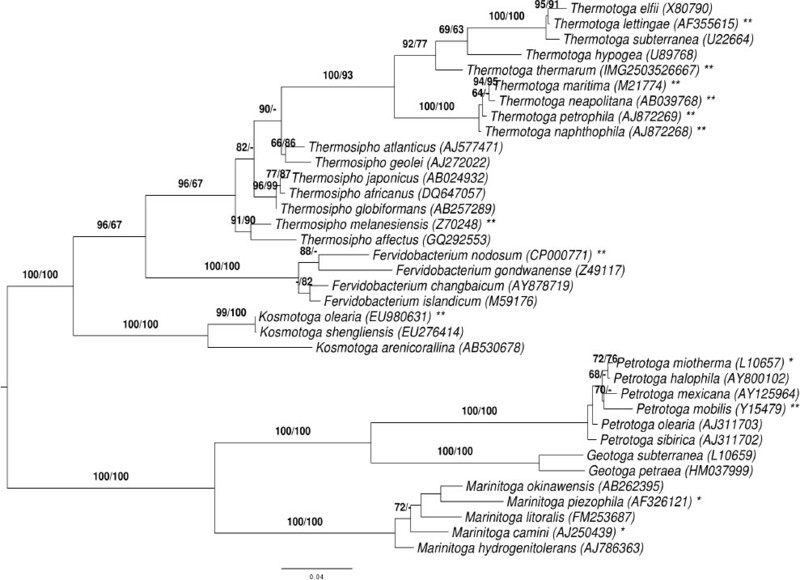 T. thermarum and T. lettingae are also the only Thermotoga species to have genes for tungsten transport (Theth_0538-540) and molybdopterin biosynthesis (Theth_0439-440, Theth_0535-536, Theth_1749). However, genes for molybdopterin synthase (moaD, moaE) could not be identified, suggesting they may have alternative genes for this step of the pathway. T. thermarum also has molybdenum cofactor guanylyltransferase (Theth_0112) for production of molybdopterin guanine dinucleotide. Adjacent to this enzyme are a formate dehydrogenase accessory protein, a formate transporter pseudogene, and a molybdopterin dinucleotide-dependent formate dehydrogenase pseudogene. There are no other genes in T. thermarum with the molybdopterin dinucleotide binding domain (pfam01568) suggesting that molybdopterin dinucleotide synthesis is no longer necessary. T. thermarum has fewer glycosyl hydrolases than the other Thermotoga species , but it has genes for transport and utilization of oligogalacturonides that are not present in the others. 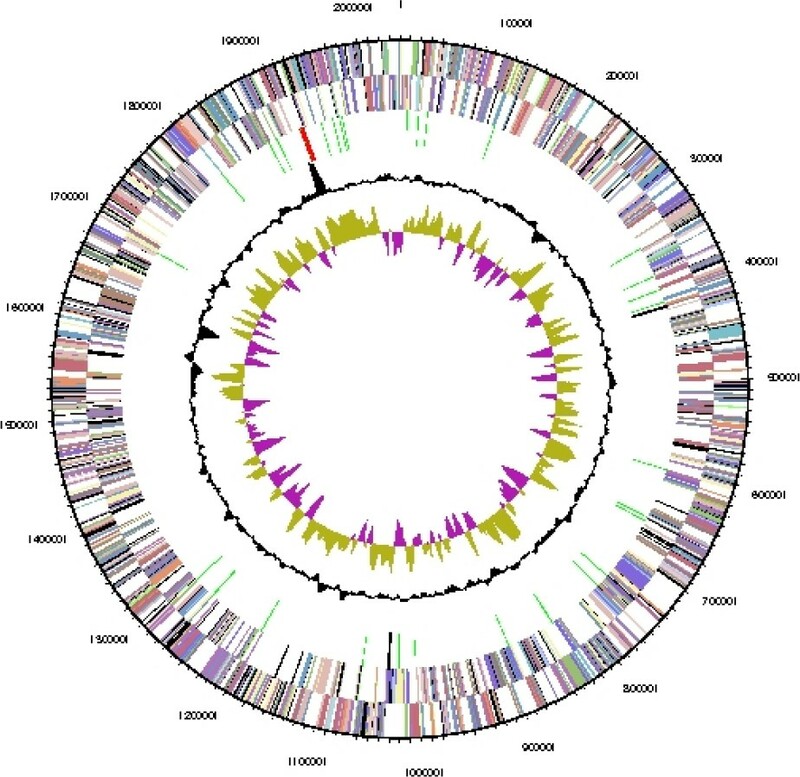 T. thermarum has an ABC transporter (Theth_0394-0396) similar to the oligogalacturonide ABC transporter from Erwinia chrysanthemi , while none of the other Thermotoga genomes contains genes similar to any of the known oligogalacturonide transporters. Close to the transporter is the kduI gene (Theth_0398) involved in oligogalacturonide degradation, which is also not found in other Thermotoga species. The transporter genes and kduI gene have 60–70% amino acid identity to genes from Thermoanaerobacter, suggesting recent acquisition from Clostridia. Other genes found only in T. thermarum and T. lettingae include enzymes for histidine degradation (Theth_0380, Theth_1683, Theth_0980) and serine degradation (Theth_1895-1896). Thermotoga species generally grow on a variety of carbohydrates, but the presence of these pathways suggests amino acids may be a carbon and energy source for some species. All Thermotoga species have genes for the Rnf complex, which couples an ion gradient to the transfer of electrons between NADH and ferredoxin. In addition T. thermarum and T. lettingae have genes for the NqrBCDEF subunits of a sodium-translocating NADH:quinone dehydrogenase (Theth_1137-1141). They lack the NqrA subunit, which contains the quinone binding site , so the other participant in the reaction (besides NADH) is unknown. We would like to gratefully acknowledge the help of Maren Schröder for growing T. thermarum cultures and Evelyne-Marie Brambilla for DNA extraction and quality control (both of the DSMZ) as well as the valuable hints provided by T. Nunoura and J.P. Euzéby. This work was performed under the auspices of the US Department of Energy Office of Science, Biological and Environmental Research Program, and by the University of California, Lawrence Berkeley National Laboratory under contract No. DE-AC02-05CH11231, Lawrence Livermore National Laboratory under Contract No. DE-AC52-07NA27344, and Los Alamos National Laboratory under contract No. DE-AC02-06NA25396, UT-Battelle and Oak Ridge National Laboratory under contract DE-AC05-00OR22725, as well as German Research Foundation (DFG) INST 599/1-2. BAuA. 2010, Classification of bacteria and archaea in risk groups. http://www.baua.de TRBA 466, p. 237. List of growth media used at DSMZ: http://www.dsmz.de/catalogues/catalogue-microorganisms/culture-technology/list-of-media-for-microorganisms.html.